CC in the title stands for “copycat.” Ever since reading Andrea’s scarf tutorial on her blog — littledidyouknow.blogspot.com — I wanted to copy her beautiful scarves. She has an amazing talent for combining different textures, patterns, and methods into one beautiful scarf. Her tutorials — spring scarf tutorials — make the process look so easy with great results. I think my copycat scarf looks great, and I love it but the process wasn’t so easy. 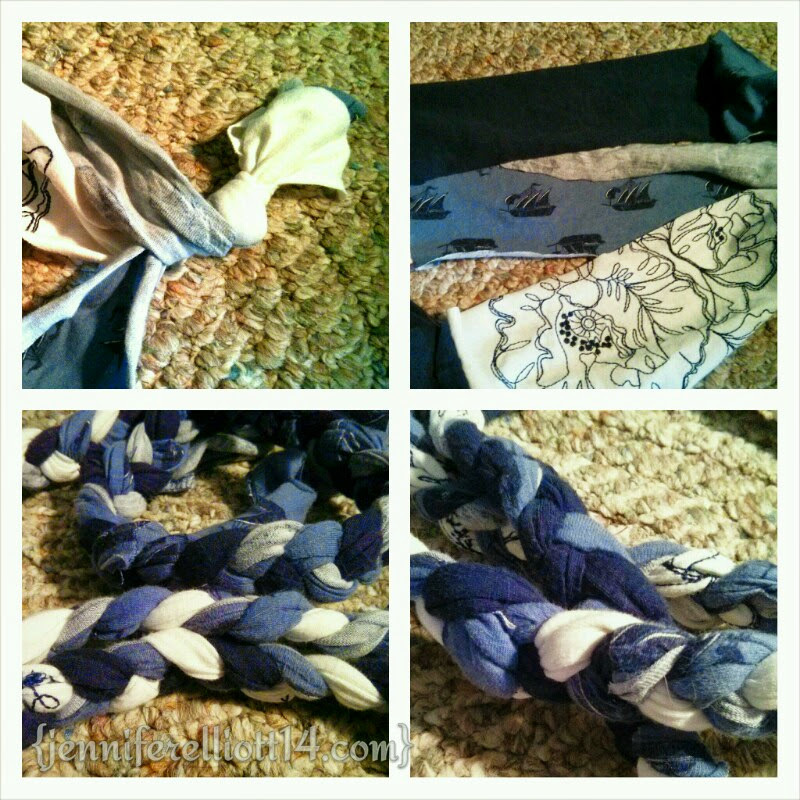 I had plenty of fabric scraps to create a blue-white infinity scarf. 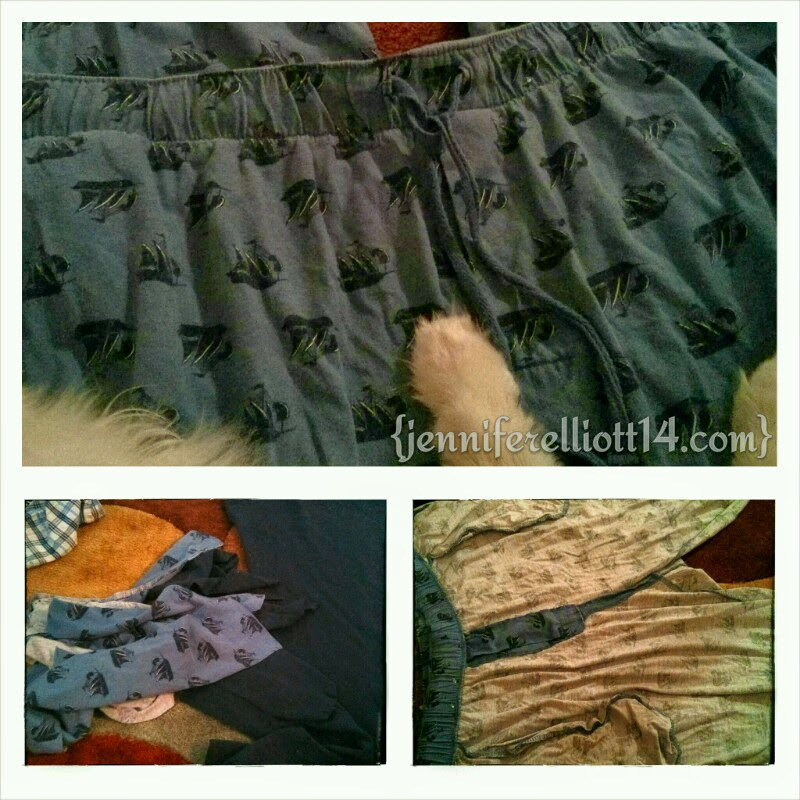 I took an old pair of my husband’s pajama pants and cut it into long strips, with the intention of sewing the strips and braiding to create the main look. In my stash, I found cut up pieces from a white shirt and a blue shirt and created strips from the remaining material. While I was at my mom’s house, I took advantage of her sewing machine and sewed the three different strips together, creating three super long strips. I knotted one end and simply braided the three strips. 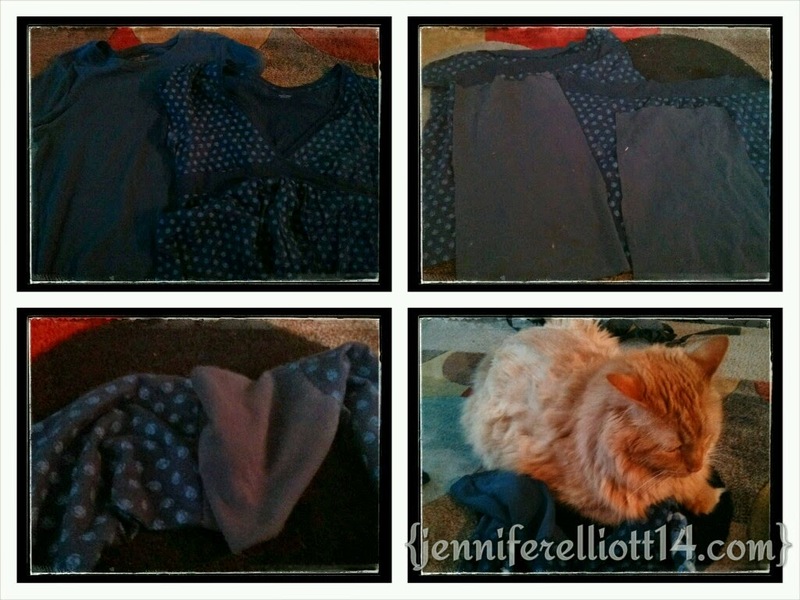 I found remaining pieces of two blue shirts in my refashion pile. I didn’t need too much fabric to create one large rectangle piece that could easily hang around my neck. For some contrast and some pattern, I used more of the patterned fabric than the plain blue pieces. After cutting, sewing, and folding, I created one long tube. Now, the fun part — creating the look of the scarf. The long braid could easily hang around my neck twice at my desired length, and the long tube of fabric was just long enough for one wrap (not really sure if that made sense). Anyway, I basically wanted the color block tube to “naturally” hang between the two braided layers. Once, I created the perfect look and length of the infinity scarf, which would easily slip over my gigantic head, I needed to tie the scarf together. I encountered some difficulty at this stage because I wasn’t sure how to wrap everything together and make the scarf look good. 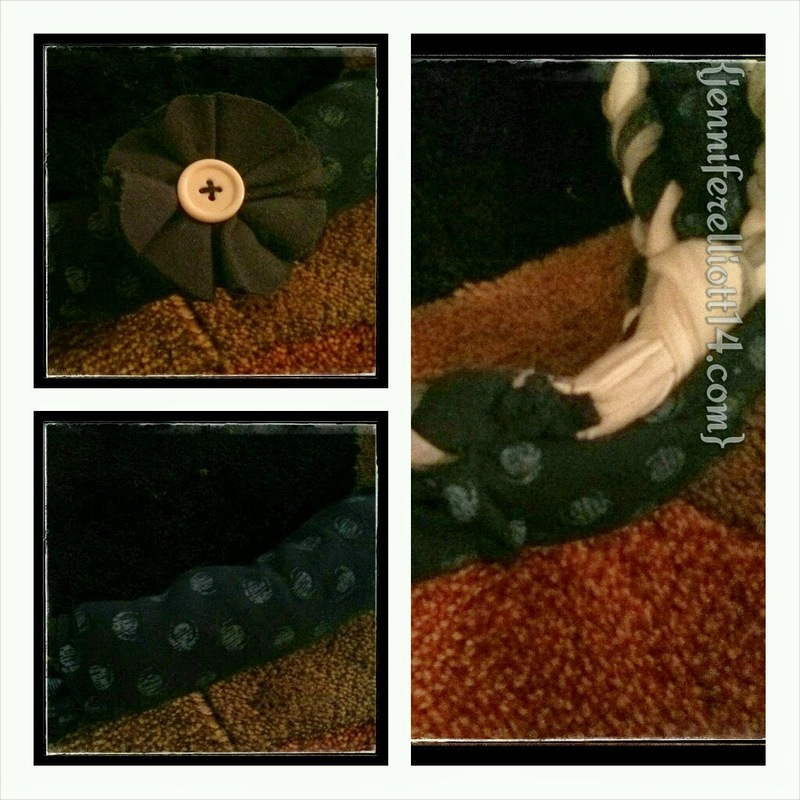 I had a few scraps of all the fabric I had used, but what looked the best? After mixing and matching, I finally settled on the patterned fabric used in the color block tube piece. I threw in a few stitches to keep the braided piece and the color block tube in place. 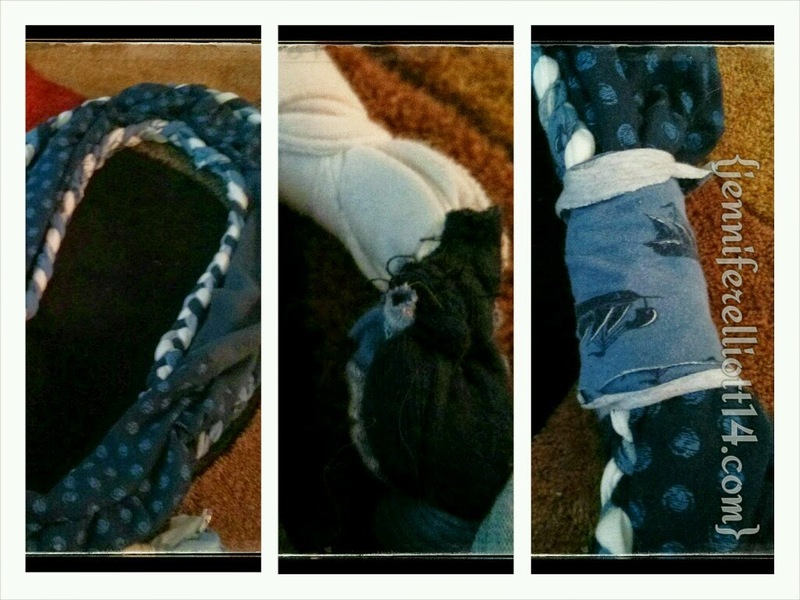 I then carefully and tightly wrapped the patterned piece around the seam part of the scarf and sewed it shut. Voila! All done! And I am in love with my new scarf. I loved I could use bits and pieces of leftover fabric scraps to create a new look, and I loved seeing one of my refashion piles go down a teeny bit. I’m sure I’ll attempt to create another scarf using Andrea’s method as a source of inspiration because I am really in awe of her creativity and abilities.